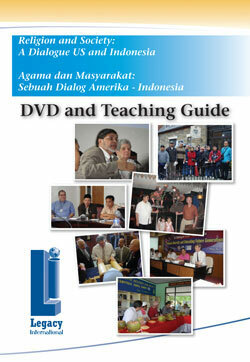 The Study Guide and DVD are an outcome of a two year- two way exchange between scholars and community leaders in Indonesia and the United States. Over the course of two years, 26 Indonesian participants and 10 U.S. participants visited each other’s countries. Discussion forums, and open dialogues, occurred in both nations reaching an audience of over 3,000 in Indonesia and 2,000 in the United States. The Bureau of Educational and Cultural Affairs (ECA) of the U.S. State Department provides participating professionals with an opportunity to increase their knowledge of the counterpart country; to establish a dialogue about the scholarship and practice of religion (particularly Islam) in both countries; and to examine the compatibility of religious practice with democratic social and political values. Legacy’s partner in Indonesia is the Center for Civic Education Indonesia (CCEI), the Indonesian branch of the non-profit Center for Civic Education, based in Calabasas, California. The Center for Civic Education has been creating student centered, innovative civic education programs throughout Indonesia and has coordinated the exchange of many community leaders programs.